Despite Sam Allardyce’s surprise exit, England qualified comfortably for the 2018 World Cup loosing any game. Though they managed just 18 goals in 10 games and often struggled to break down tactical-minded teams. Sam Allardyce’s successor Gareth Southgate stepped up from an under-21 role. There were disappointing crowds at Wembley – but England still had the highest average attendance of any European qualifier. England were drawn in Group G along sides Eden Hazard's Belgium, Panama and Tunisia. 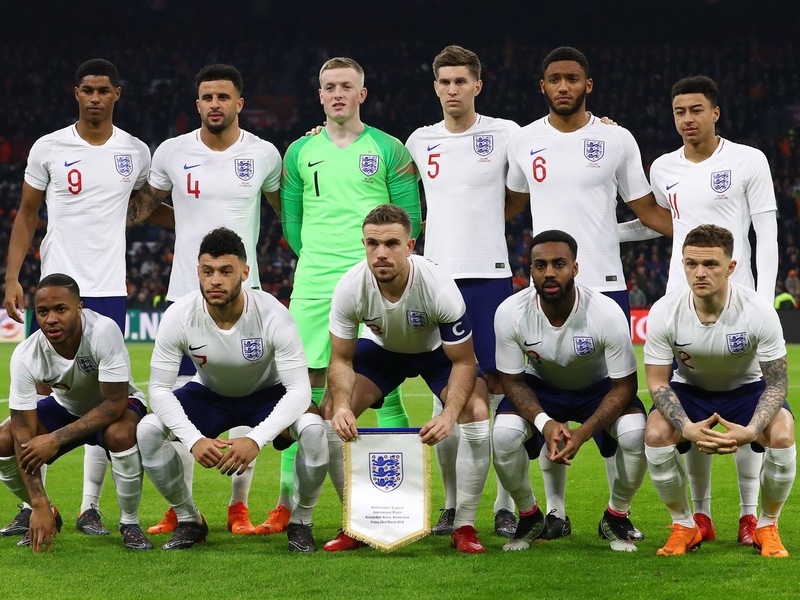 England open their campaign against Tunisia on the 18th of June, followed by Panama six days later, and then their toughest test is against Belgium on the 28th. Team skipper Harry Kane rescued the side on numerous occasions with crucial goals and was appointed captain in October 2017. Spurs midfielder Dele Alli makes clever runs from midfield. Liverpool midfielder Jordan Henderson was Southgate’s preferred choice to anchor the midfield, with Tottenham midfielder Eric Dier. Manchester City’s Kyle Walker is a vibrant attacking right-back. Manchester United forward Marcus Rashford was deployed as a wide attacker or from the bench. All-time leading scorer Wayne Rooney announced his retirement from international football in August 2017. Liverpool duo Adam Lallana and Daniel Sturridge missed majority of the qualifiers through injury. GOALKEEPERS: Jack Butland (Stoke), J. Pickford (Everton), Nick Pope (Burnley). DEFENDERS: Gary Cahill (Chelsea), Harry Maguire (Leicester City), Fabian Delph (Man City), Phil Jones (Manchester United), Danny Rose (Spurs), John Stones (Manchester City), Kieran Trippier (Spurs), Kyle Walker (Manchester City), Ashley Young (Man United) Trent Alexander-Arnold (Liverpool). MIDFIELDERS: Eric Dier (Spurs), Dele Alli (Spurs), J. Henderson (Liverpool), Jesse Lingard (Man United), Ruben Loftus-Cheek (Chelsea). Alex Oxlade-Chamberlain is out with a knee injury picked up against Roma during the Champions League.